“We cried for days on end,” Hendrichs said, recalling the death of his faithful friend more than 15 years ago and its sad end that prompted him to set up a cemetery for pets south of Berlin. “We often see very sad scenes here. People cry buckets,” the 66-year-old said, noting that some even turn suicidal. “For us, a pet is not just an animal, but a companion, a member of the family” who deserves to be given a dignified send-off, he said. “Suddenly, there was this massive hole,” he said, recalling the day when Hiro died just before Christmas. “I needed time for me,” said the 27-year-old, who lives with his father and another cat. 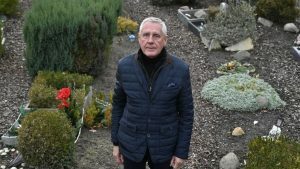 “For the last 14 months since he died, I’ve come here everyday, twice a day,” said the 63-year-old, who has turned Alien’s grave into the most decorated and colourful in the cemetery. “A domestic animal as a social partner, in particular for singles, has become more and more important in our society,” said IVH president Georg Mueller in the 2017 study, noting the trend among both the elderly and younger adults. “Young adults who have a very busy professional life often have an animal at home,” he said. At the Teltow cemetery, boxes of tissues are available at every corner — at the entrance of the main building, the crematorium or the quiet room, where the walls are covered with photos of dearly departed companions. And Hendrichs is there too to lend a listening ear; a pet owner’s grief needs to be taken seriously, he stressed. “Some say that a dead animal is poisonous — that’s completely wrong,” said Hendrichs. Each grave plot costs 180 euros ($200) for every two years, plus 120 euros for burial costs, while cremations cost between 105 and 370 euros depending on the animal’s weight. Other products are also available, such as urns or personalised keepsakes — a paw print mould, a pendant containing the pet’s ashes or a diamond created from the ashes starting at 2,500 euros. “With that, the owners can have their former companion close by all the time,” said Hendrichs. The post My dog and I, til death do us part appeared first on SABC News – Breaking news, special reports, world, business, sport coverage of all South African current events. Africa's news leader.. PREVIOUS POST Previous post: Would you hire a wig for R100 per day?